We never seem to be short anything to do at the moment. The boiler surveyor inspector examined FR 20’s boiler last Tuesday and, apart from a couple of issues, found it to be in good health. 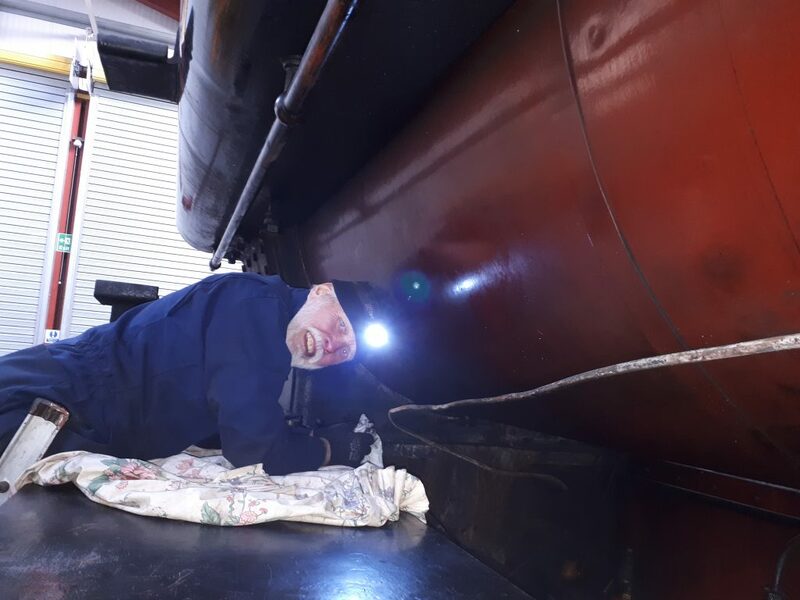 There are two corner screws to change as the heads inside the firebox have wasted and the ‘J’ pipe needs to be examined further to check against possible corrosion. The main event on Wednesday was to conduct a wash out on Cumbria. 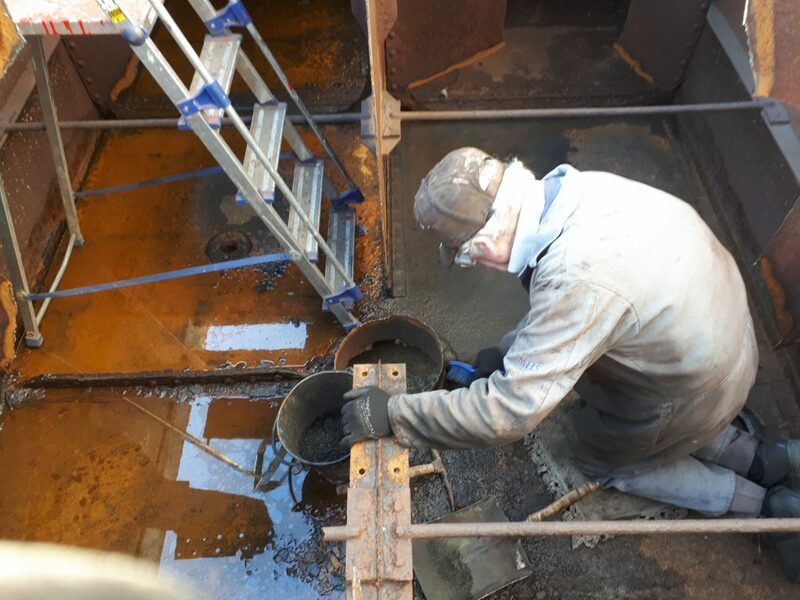 There was a fair amount of scale on the foundation ring so John, Tim and Ade all took turns in blasting it with the water pump lance and scraping out the sediment. Ade is pictured here under the frames with the lance. 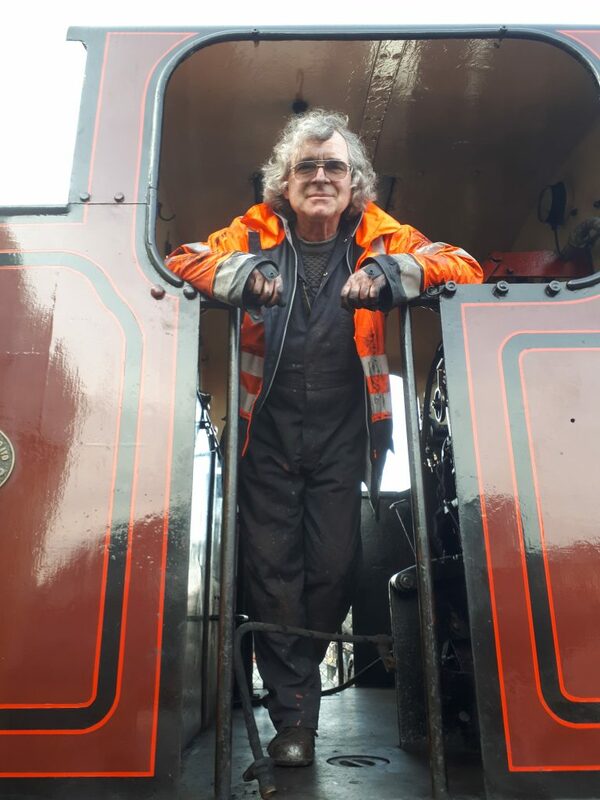 Ade also received some driving instruction on Sentinel diesels and is seen here about Cumbria ready to do the shunt at the end of the washout. 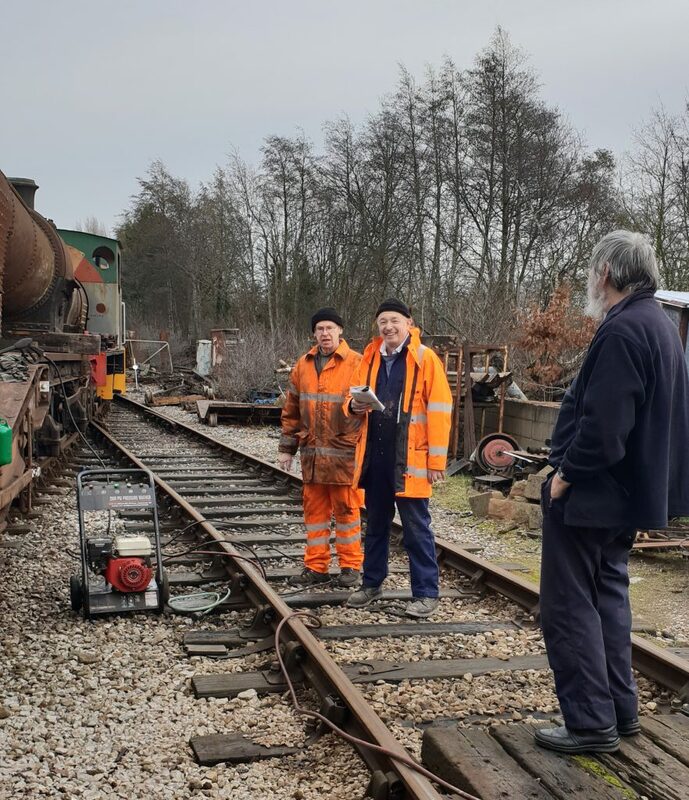 There was further progress on Fluff with John Davis, Howard and Phil Bell all contributing to the task. We now have two Phils on a Wednesday, the other doing a good job cleaning up Cumbria‘s cab. 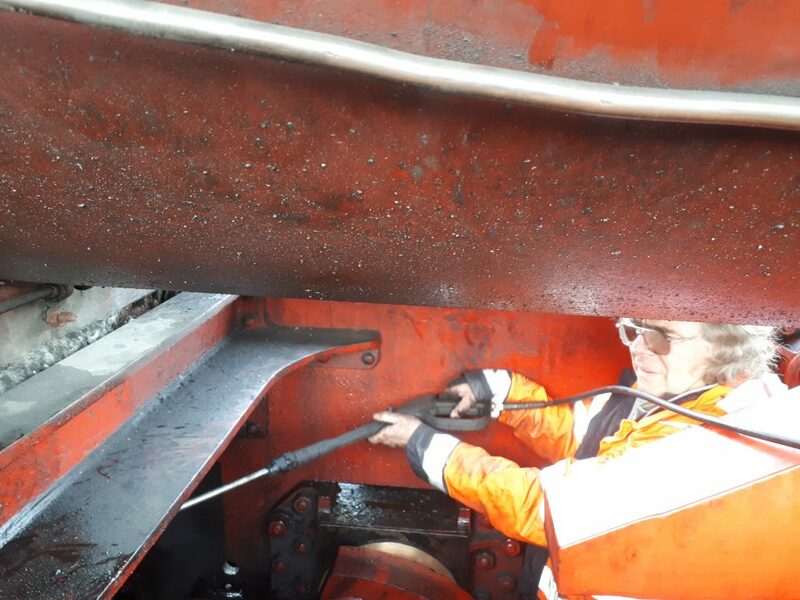 Jeff Nixon at CMS Cepcor managed to find a slot on Thursday to undertake the skimming of the journals on FR 20’s tender wheelsets. 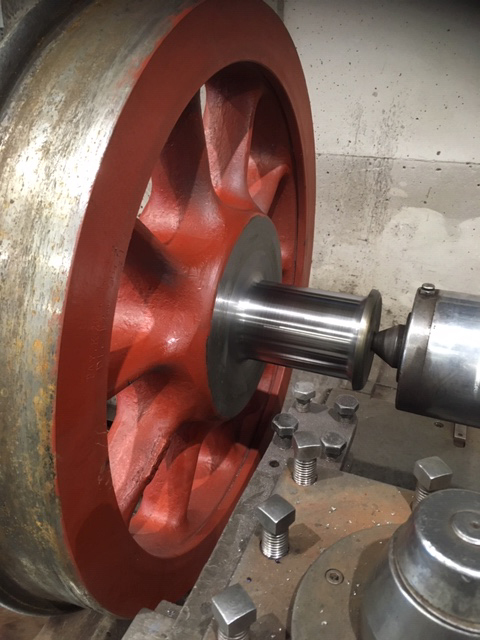 He kindly sent us some footage of one of the wheelsets in the lathe. 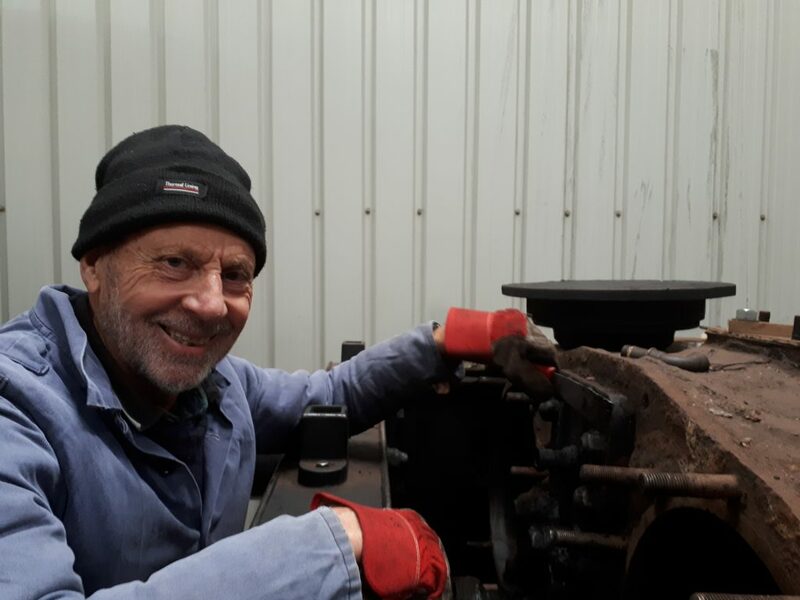 After having gloss painted FR 20’s drag box and underside of the cab floor on Wednesday, John then bolted down the floor on Friday. Roger kindly took on the task of cleaning Cumbria between the frames, making use of his head torch. Bob was missing from Friday’s working party (too busy consulting his lawyer regarding scurrilous accusations in a previous blog?! ), however Fred spent his time cleaning out scale from the floor of Wootton Hall‘s tender tank. 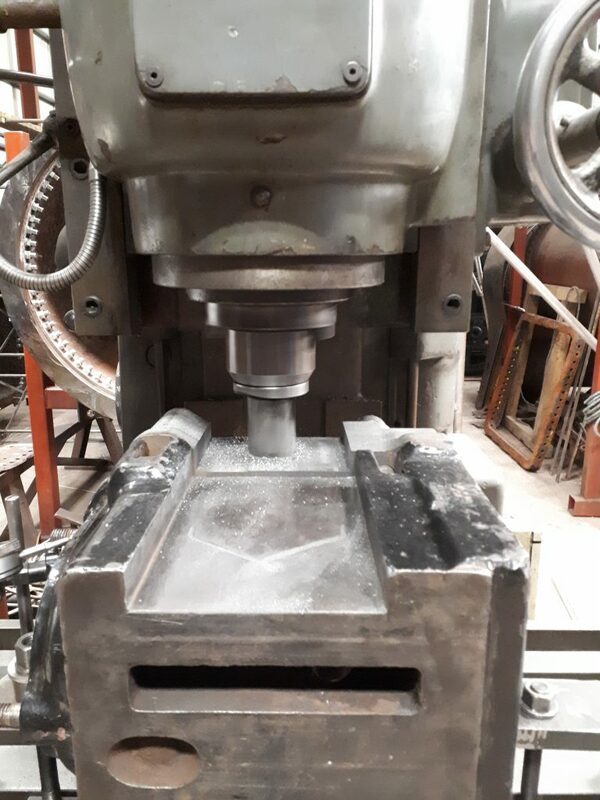 Bill Norcross has been busy machining the new underkeeps for Wootton Hall‘s tender axleboxes. 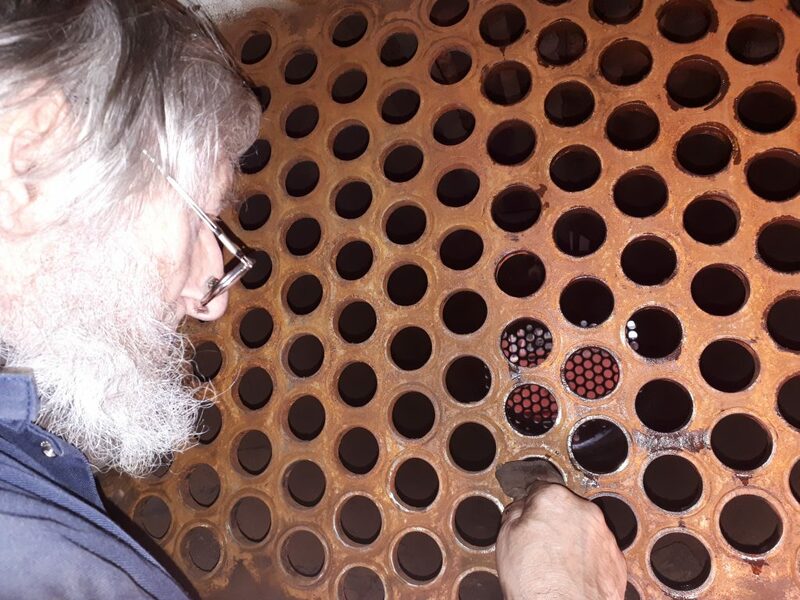 After Alan had inspected and cleaned the tubeholes on FR 20’s boiler, Friday afternoon was spent loading the new tubes into place. 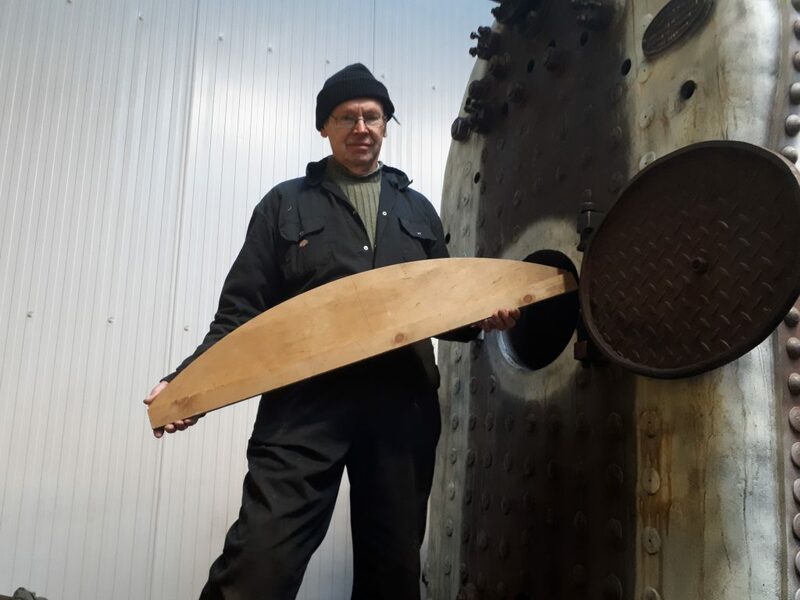 A supply chain was set up to hand over the tubes to Tim and John Dixon, who placed them into the boiler and applied suitable force where necessary. 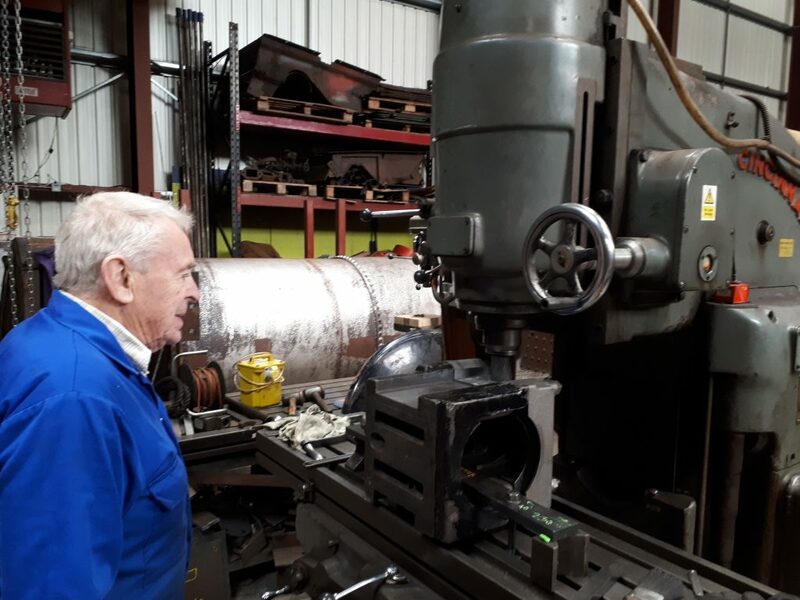 Meanwhile Alan spent his time in the firebox guiding the tubes into the correct hole and shouting suitable forms of encouragement to those loading the tubes. All in all, a very busy couple of hours! 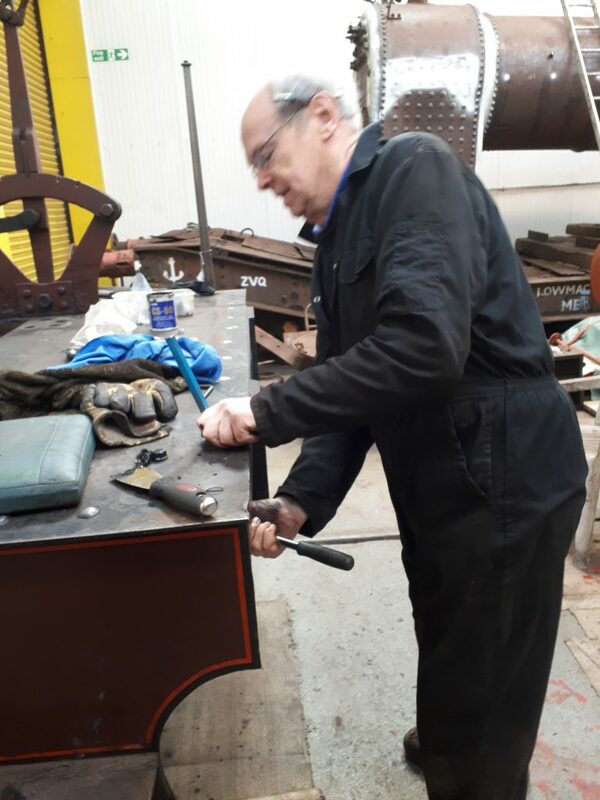 George appeared on Saturday and did some work on Cumbria‘s steam brake. The installation of a new overhead safety wire system is booked for this coming Thursday. 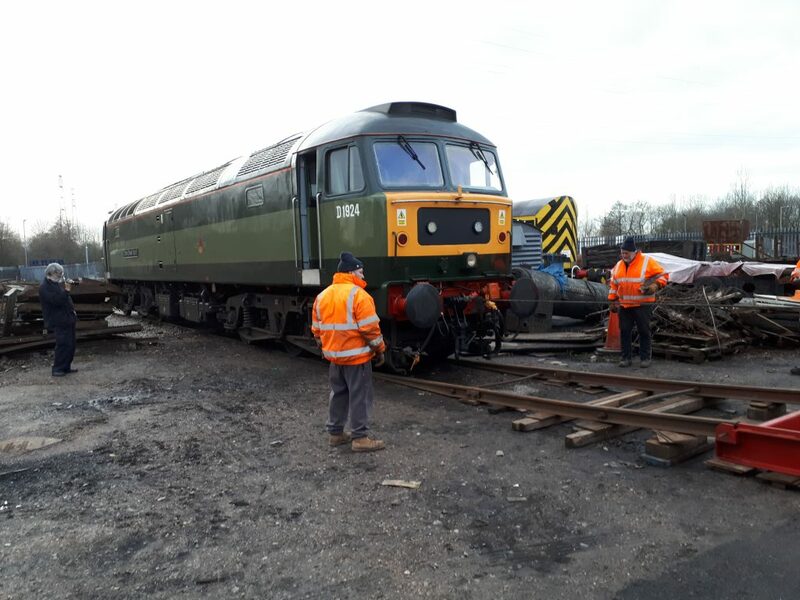 The rolling stock will have to be moved out of road three in both the heated and unheated sections of the shed by 08.00 to enable access for both a cherry picker and tower scaffold, which are due to be delivered to site on Wednesday. 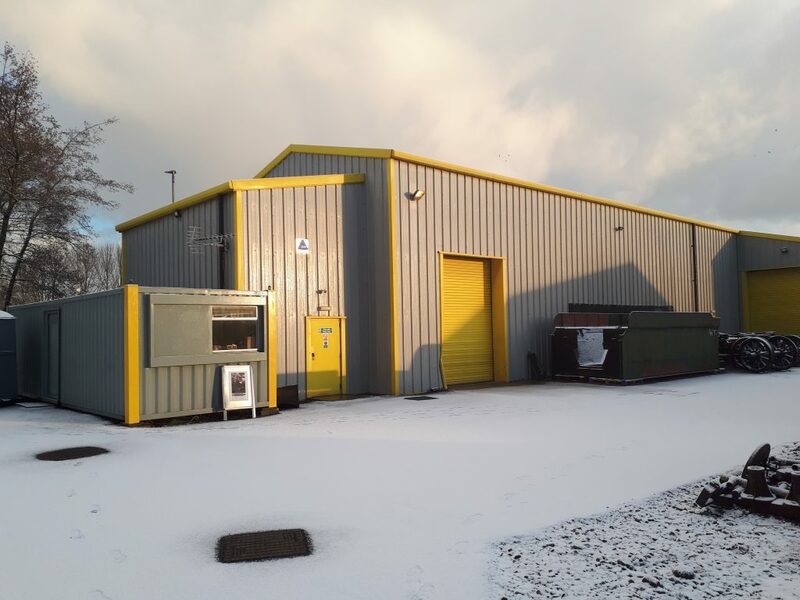 There will also be a need to move various items out of the way on Wednesday to enable the work to take place. There will be training on the new safety system at the end of the day on Thursday, so all are welcome to attend. Hopefully, everything will be back to normal the following week. We have received details of the funeral of former Live Steam guitarist, Stuart Bennett (see last week’s blog). A service will be held on Friday 1st March at 10.30 in St. James’ Church, Blake Street, Barrow followed by cremation and a wake, provisionally to be held at the Royal British Legion in Holker Street. Please note that owing to the Blog Putter Upper going off on a jolly abroad next week without his laptop, there will be no blog next Monday. We start this week’s blog with profuse apologies to Bob. Last week’s publication erroneously summed up Bob’s contribution as “poring over drawings, sensibly in close proximity to the kettle in the warmth of the mess room.” However, it appears that our Friday correspondent had not done his homework and Bob assures us that he had in fact been busy in the workshop repairing Cumbria‘s regulator valve. We trust that this full and frank apology will spare the Trust any litigation. 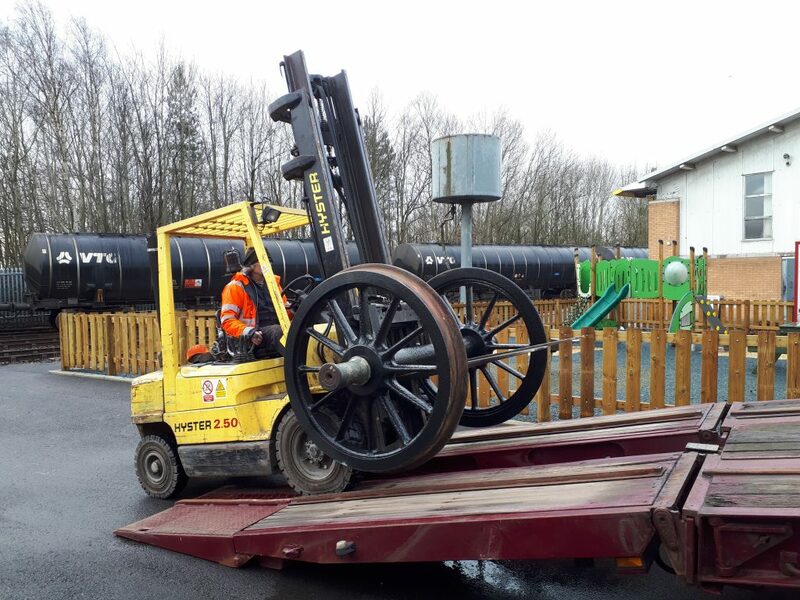 Wednesday started early with members on site in good time to enable prompt loading of seven wheelsets when the low loader arrived. Just for the record there were three from Wootton Hall‘s tender, both Caliban‘s wheelsets and FR 20’s tender wheelsets. These are expected back sometime next month after attention to tyres and/or journals. Adrian is seen here with the fork lift. 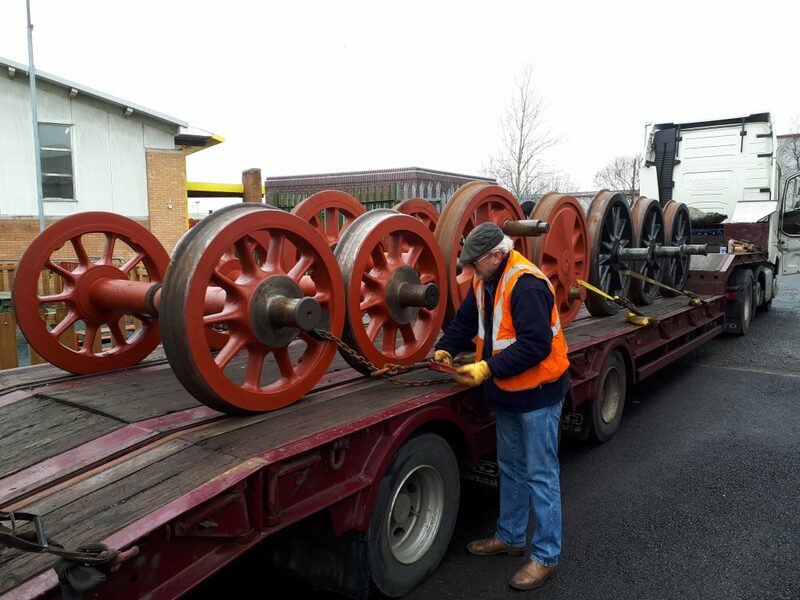 Martyn Soames straps the wheelsets to his rig. Once the wheelsets had departed it was time to wash out FR 20’s boiler. This had been delayed by bad weather over the previous two Wednesdays. 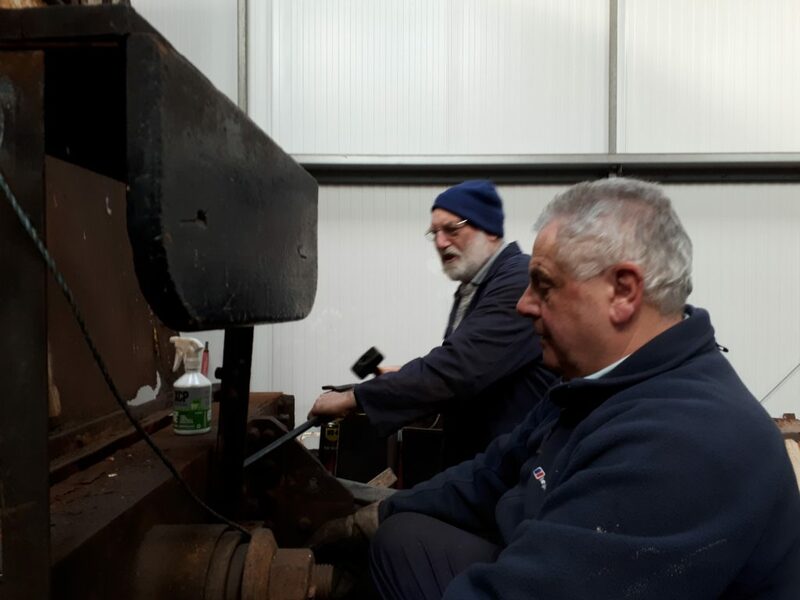 Alan and John watch on here as Tim takes the drastic step of inspecting the instructions for the water pump in the hope that it might be coaxed into life. Fortunately, Mike appeared and twiddled the right knobs with the result that a throrough wash out was carried out. An inspection by the boiler surveyor is booked for tomorrow, Tuesday. The rest of Wednesday was spent watching Crewe’s Class 47 D1924 being winched on to a massive trailer for trip back to its home depot. The loco had taken refuge at the RSR the previous Thursday after suffering a problem which prevented any longer distance movement by rail. We trust that D1924 will soon be back in good health. 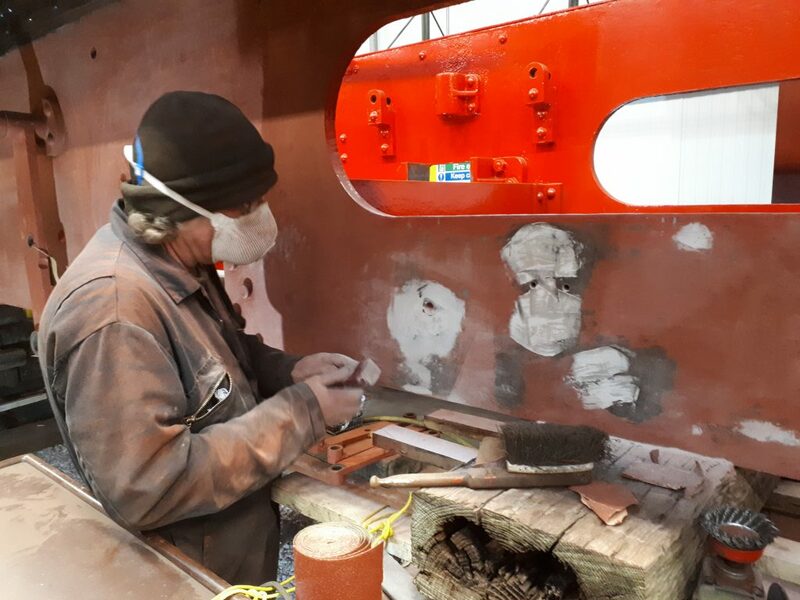 On Friday John Dixon and Roger continued their work on FR 20’s drag box, attending to the securing holes on the footplate and applying a coat of undercoat. Matt Jervis made a start on removing Cumbria‘s regulator (borrowed from 3793) and ‘J’ pipe whilst Fred continued to clean Caliban‘s buffers. 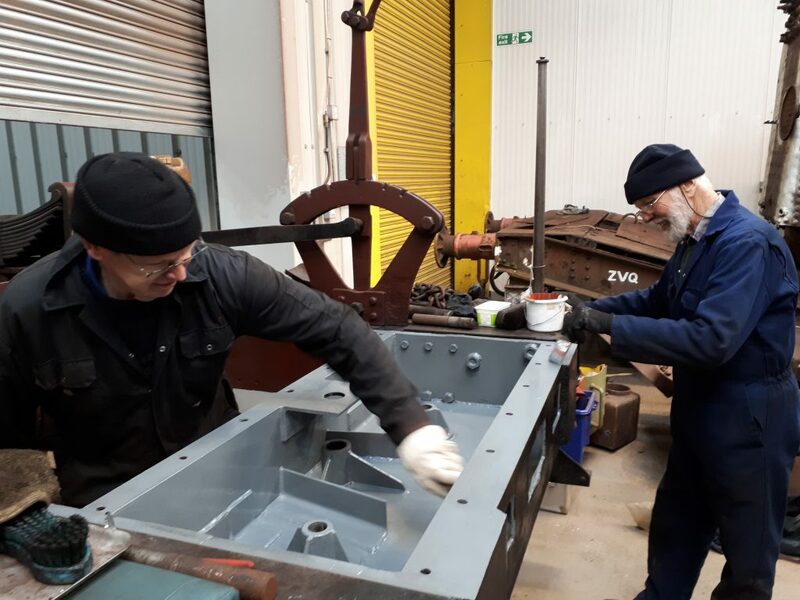 Paul Newton continued his work on the former L&NWR platform seat and John Davis and new volunteer Phil Bell attended to the removal of Fluff‘s rear cab sheet. 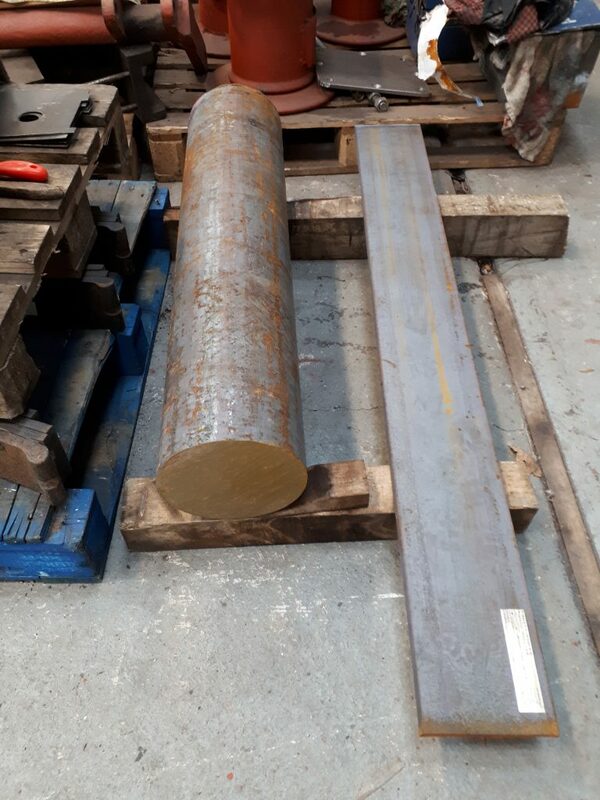 There has been more progress on Wootton Hall with the arrival of new steel for the construction of the reverser – no, that round thing isn’t a log! 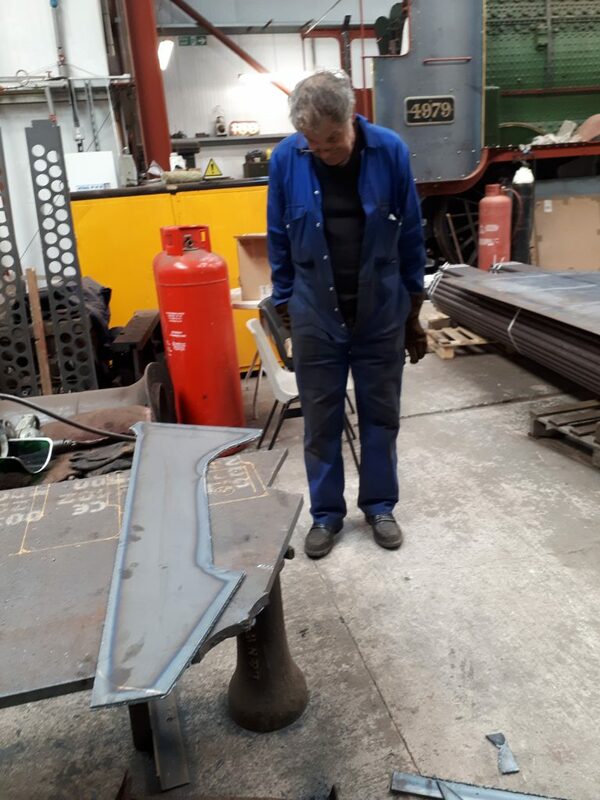 Keith has started the job of making up pipework for the injectors and is seen here with a newly cut corner stay for the recently purchased tender tank. We conclude with the sad task of recording the death last Thursday evening of former Live Steam band member Stuart Bennett. 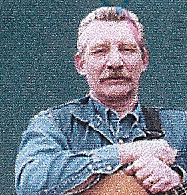 Stuart had, in the 1970s, been a member of popular South Lakeland folk group Bag ‘O Rags, which had entertained members on many occasions during those folk revival days. They were legendary occasions which brought many of our members together and the tales are still retold of merry nights out at such hostelries as the White Hart at Bouth and the Swan at Urswick. In 1999, after a period of time away from the folk music scene, Stuart accepted an invitation to join Live Steam and brought a new dimension to the band with his vocals, harmonies, guitar instrumentation and contributions to musical arrangements. Stuart clocked up over 140 gigs with the group, including the recording in 2001 of the CD Silver Jubilee, before reluctantly having to retire through ill health in 2008. We had many, many good times together and we send our sincere condolences to Stuart’s wife, Carol, and his family.